When there is perfect competition. 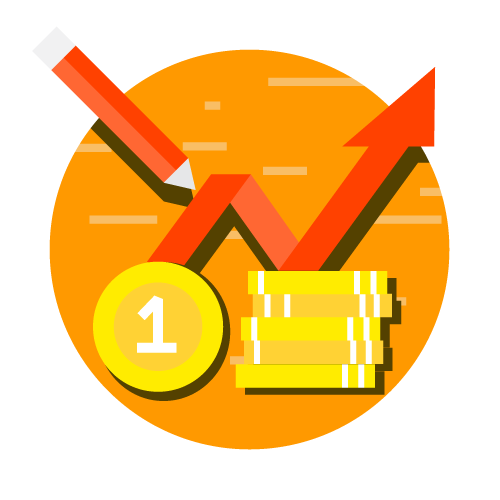 an individual firm cannot influence the price of a factor, by buying more or less of it, because its own demand for the factor constitutes a small fraction of the total demand. Consequently, a finn has to accept the price of a factor. say. labor. prevailing in the market (i.e., wage) as given. Similarly, n.o individual supplier of a factor supplies an appreciable quantity thereof so as to be able to affect its price ill the market. In this case. therefore. marginal factor cost (MFC) and average factor cost (AFC) will tend to be equal and their curves will be the same or they will coincide. and will be a horizontal straight line as in the case uf product prices. In the commodity market also. under perfect competition. marginal revenue (MR) and average revenue (AR) arc equal aim they arc represented by horizontal straight line. 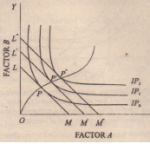 MRP is the marginal revenue productivity curve and the same curve represents the value of marginal pro conductivity (YMP). because we assume perfect competition in the product market. PW horizontal straight line represents bush marginal factor cost MFC and average factor cost AFC. This firm will obtain maxi- mum profit where marginal revenue productivity (MRP = YMP) is equal to the marginal factor cost (MFC). They are equal at the po nt E where the two curves intersect. At the point f equilibrium. Ihe firm will employ ON quantity of the f tor and pay 01′ (= EN) as the price or wage the position of maximum profit.